Years ago when living in Dallas, I would often go and eat dim sum on the weekends, something that is definitely missing in Milwaukee. One of those dim sum items was soft and tender chicken feet. Yep, I tried them (what’s not to try), and I can’t say that I was a big fan on the texture of them. Somewhat gelatinous with too many bones. OK, I was not a fan. But on a recent outing to one of our local ethnic grocery stores, I saw a package of them and decided to make them, only this time crispy. 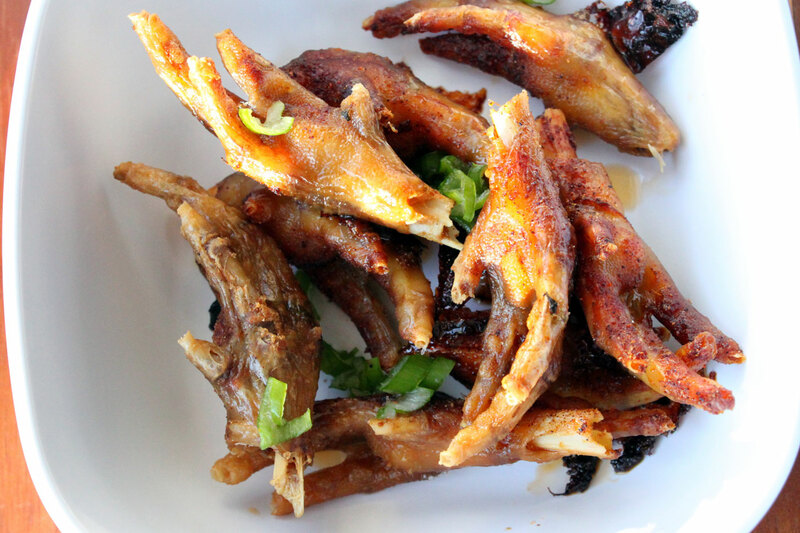 See my oldest is a huge fan of crispy chicken wings, and as these chicken feet with super cheap, I decided I would see if I could crisp them up and not only try them, but to also see if my oldest would eat them, or like them. Indeed he did! Start by clipping the nails off of the feet. I did this by using my kitchen shears and clipping at the knuckle joint. Discard. To a large bowl, add the feet, and rinse them thoroughly in cold water. Next, add the feet to a medium sized pot, add the soy sauce, garlic, salt, and cover them with water. Bring the pot to a boil, then reduce the heat to low and cook for about 2 1/2 hours. Remove the feet to another bowl, let cool, and place in the refrigerator overnight. The following day, remove the feet, and pour out any excess water. To a medium sized pot, on low heat, add in the oil. Then after a few minutes add in the chicken feet. At first I was going to deep fry these, but there is so much skin that I knew oil would be popping everywhere, and I did not want that. I simply wanted to slow cook them for about 15 minutes on low heat to continue to cook them. After about 15 minutes, remove them with a slotted spoon or spider, to a paper towel lined sheet pan to let any excess oil drain off. To a sheet pan, add the parchment paper to cover. Add the chicken feet and sprinkle your favorite barbecue seasoning all over the feet. Stir around so that all of the chicken feet are covered with seasoning. Place them into the oven, and slow roast until they are nice and crispy, about 45 minutes to a hour. Every oven is a bit different so keep an eye on them until they are nice and dark golden brown and crispy. Remove from the oven, place them in a bowl, and dig in. Were these good? Yeah, they were pretty darn good. My oldest loved them and was eating them all to the base of the feet, and my middle guy was suspicious and tried one and it kind of freaked him out, as they probably might to most Americans. But I will admit that these are common snacks in Asian countries, and if you are looking for something unique to serve up, give these a try. They are cheap, and pretty darn tasty. Hope you enjoy! I don’t know about this one! I’ve heard in some countries chicken feet are a delicacy! I don’t know if I could bring myself to eating them! 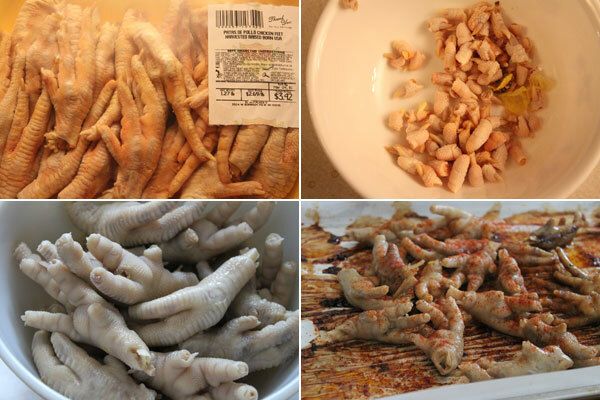 Though this is the best recipe Iv’e seen so far for chicken feet. Ha!! Haha! If you get over the thought of feet, they are actually preety good. Even my pickiest of eaters devoured them. Thanks for the comment, Patricia. You’re right, once you get over the idea they are great little snacks. Not a whole lot to them but fun to eat. A very long recipe with not enough satisfaction. After the 2 1/2 hour simmering the chicken feet, and overnight refrigeration, all the liquid becomes gelatin, so you can’t drain off any excess water prior to putting it in the oil. Putting the chicken feet in the oil makes a big mess in the hot oil spatters causing you to get burnt. Not a very safe thing to do and can cause a grease fire. I didn’t use barbecue seasoning, and I opted to use salt and pepper so I can get the full flavor of the chicken. The chicken feet Become somewhat crispy in the oven, but the of in process the gelatin in the feet toughens up so it was difficult to get much meat off of the chicken feet but the flavor was good. Overall it wasn’t worth the hours of preparation and the big mess. The traditional way of cooking chicken feet is much better in my opinion. I prefer the traditional way of cooking chicken feet through brazing and slow cooking because you get more of the meat off the small bone easier and less mess.